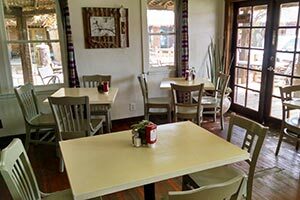 Open daily for lunch 11 a.m. to 2 p.m., dinner 5 to 9 p.m. (to 9:30 on Friday-Saturday), and Sunday Brunch 9 a.m. to 2 p.m. California cuisine, seafood, steak, chicken, pork, pasta specials, salads, fruit and veggies from the Inn's Faultline Farm garden. Cocktails, local beer on tap, great wine list. Art-filled dining room and poolside tables. Music nightly. Bag lunches available for hikes in the park. On-site catering for events, meetings, film shoots, weddings. Dinner Friday-Saturday 5-9 p.m. Dinner Tuesday, Wednesday, Thursday, and Sunday 5-8 p.m. (Closed Monday.) Southern fried or grilled catfish, salmon, shrimp, steak, chicken, burgers, collard greens, fried pickles/okra/gizzards, Po-Boys, and desserts. Cocktails, wine, craft beers. 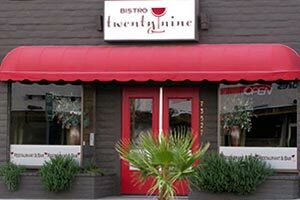 Restaurant is available for private events, wedding dinners, cocktail receptions, business meetings. Order online for pickup or delivery. On- and off-site catering available. 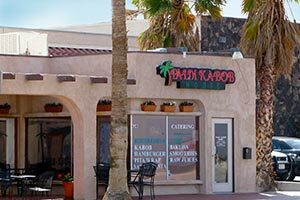 Open daily 11 a.m. to 9 p.m. for lunch and dinner, drinks and sports viewing, or parties and family gatherings. Largest cocktail bar in town and open all day! Margaritas, beer, wine, complimentary chips and salsa. Flat screen sports TVs are mounted in the bar and throughout the restaurant. 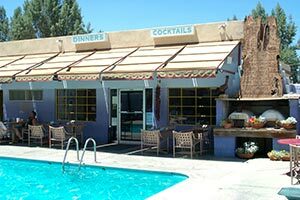 Longstanding family-friendly restaurant serving a variety of Mexican dishes. Room available for meetings and gatherings. Open 4 to 10 p.m. Thursday thru Monday. Caribbean fusion. Signature burgers, veggie burger, fried chicken sandwich, jerk chicken wings, plantains, chickpea flatbread, kale salad. 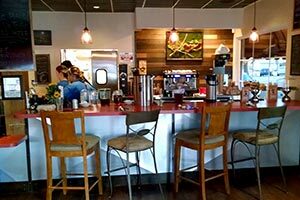 Artisan sodas, coffee, tea. (Beer/wine coming.) Reservations online or by phone. Takeout & Delivery services for 29, JT, YV, Landers, (760)401-2909. Catering services available for on-site and off-site events. 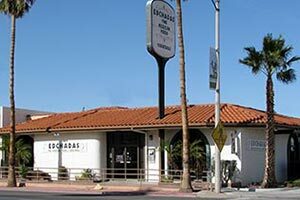 Open daily for breakfast at 8 a.m., lunch and dinner 11 a.m. to 8 p.m. (Sunday to 3 p.m.) Breakfast burritos, omelets, waffles, yogurt, Joshua Tree Coffee. Appetizers and entrees, crab cakes, hummus, Pierogies, Empanadas, tuna/chicken/patty melts, fish, grilled chicken, burgers, Yucca Root fries, chili and soup-of-the-day, Smackaroni & Cheese. Dessert specials. Craft beers and wine. See our eclectic Mojave Sol gift shop next door (where you can also buy Joshua Tree Coffee by the pound)! Open weekdays for lunch 11 a.m. to 3 p.m. and dinner 4:30 to 9 p.m. (closed Wednesday). Open Saturday 1:00 to 9:30 p.m., Sunday 2:00 to 9:00 p.m. Authentic Thai cuisine cooked to order, featuring Thai pan fried rice noodles, Thai noodle soup, spring rolls, Pad Thai, Tom Khar, fried rice, curries, and a variety of Asian dishes and appetizers. 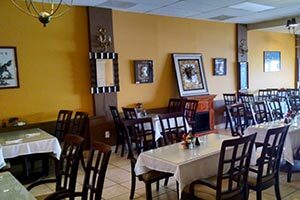 Dine in the classic dining room or order take-out food to go. Beer, wine.